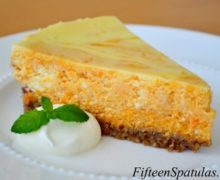 This Sweet Potato Cheesecake is the perfect dessert for the holidays and fall! Sour cream cheesecake is swirled with sweet potato and cinnamon, and baked on a pecan crust. Smooth, silky, creamy cheesecake custard with sweet potato swirled in, and a tender pecan crust on the bottom. AMAZING. And to think, it all started because I had some sweet potatoes that were starting to sprout and needed to be used. I also conveniently had some cream cheese and sour cream in the fridge that needed to be used up. 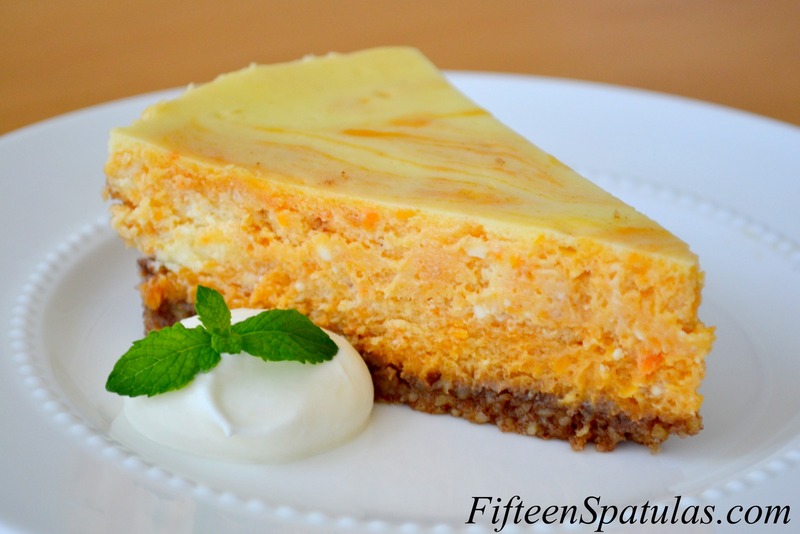 And the light bulb went off…SWEET POTATO CHEESECAKE! Instead of the usual graham cracker crust (which I don’t like…mostly because I can never find graham crackers that don’t have partially hydrogenated oil), I decided that pecans would go beautifully with the sweet potato. You will notice that I swirl the sweet potato into the cheesecake, as opposed to the sweet potato being totally mixed into the custard, but you could also mix the sweet potato puree directly into the custard if you desire. But I think it’s prettier with the swirls, and it gives a bit of a flavor contrast. For the crust, take the pecans, sugar, salt and vanilla for a spin in the food processor, until the pecans are a bit chopped. Add in the butter and process until it starts riding around the blade a little bit. Be careful not to pulse it into pecan butter. Dump the pecan mixture into your cake pan or springform pan (whatever you’re making the cheesecake in. I don’t bother with springform pans. I just use a cake pan). Pat it out with your finger tips, and push it up the sides a little bit. Bake for 8-10 minutes, then let it cool on a wire rack. Turn the oven down to 250 degrees. To start the cheesecake, pierce the sweet potato with a fork several times, then microwave for 8 minutes until tender. Scoop out the flesh, then puree it in a food processor. You should have about 1 cup. Set it aside. 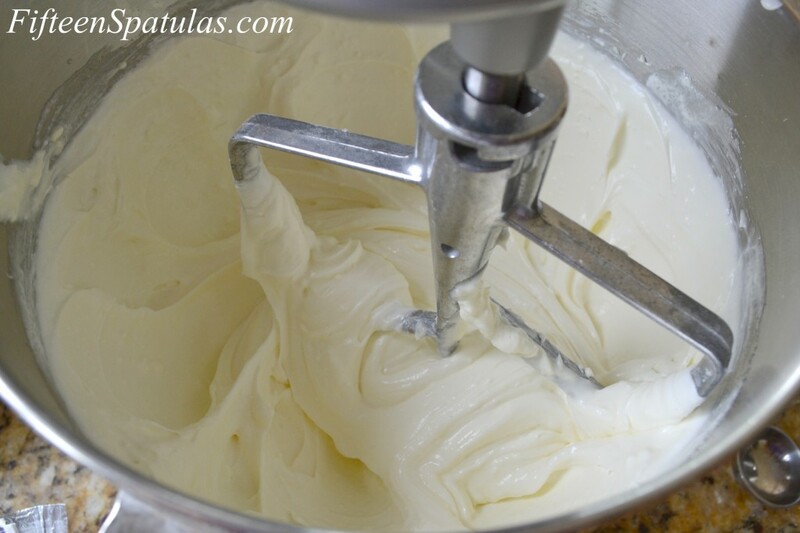 In the bowl of a stand mixer (or you can use a hand mixer instead), beat the sour cream for 15 seconds with the paddle attachment to spread it around the bowl really well. Add the cream cheese and sugar, and beat on medium speed until it’s smooth and everything has blended into one homogeneous, well combined mixture. In a small bowl, whisk to combine the eggs, egg yolks, heavy cream, and amaretto. Pour half of it into the cream cheese mixture, and beat until incorporated. Scrape down the bowl, then add the rest of the cream cheese and beat again, until smooth. Move 1 cup of the cream cheese mixture to another bowl, and add the sweet potato puree, 3 tbsp sugar, 1/2 tsp cinnamon and small pinch of nutmeg and mix until combined. Spread half of the sweet potato mixture on the bottom, then half of the cream cheese mixture on top of that. Swirl with a spatula. 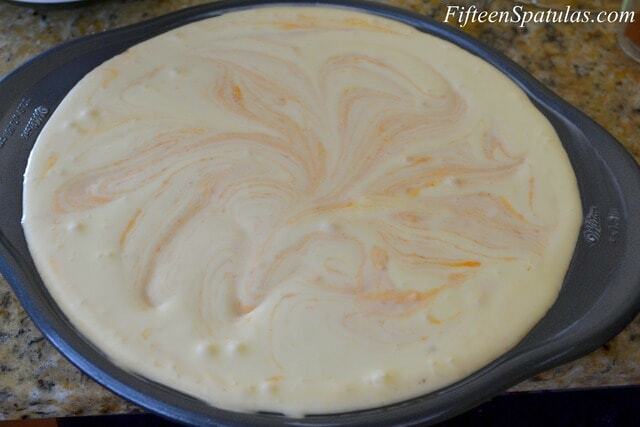 Add the rest of the sweet potato mixture and cream cheese mixture, and swirl again, until you have a beautiful pattern. Bake at 250 degrees F in a water bath for 1 hour. Turn the oven off, open the door for 1 minute, then shut the door and leave in the oven for 1 more hour. Remove from water bath, and chill in fridge for 6 hours before serving. When slicing, dip your knife into hot water first. ENJOY!!! Oh, I am all over this! My boyfriend and I accidentally made a sweet potato pie last fall (long story) and I completely fell in love with the idea of baking with it more! And cheesecake? What could possibly go wrong with a cheesecake? Yum! I usually toast my nuts to use in baking recipes, since I’m going to bake the crust, there’s no need to toast the nuts, right. 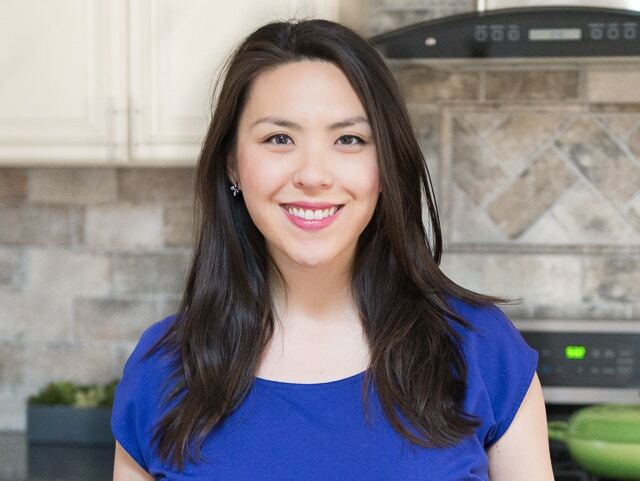 Hi Joanne, luv this recipe! I loved the fact you made a pecan crust. 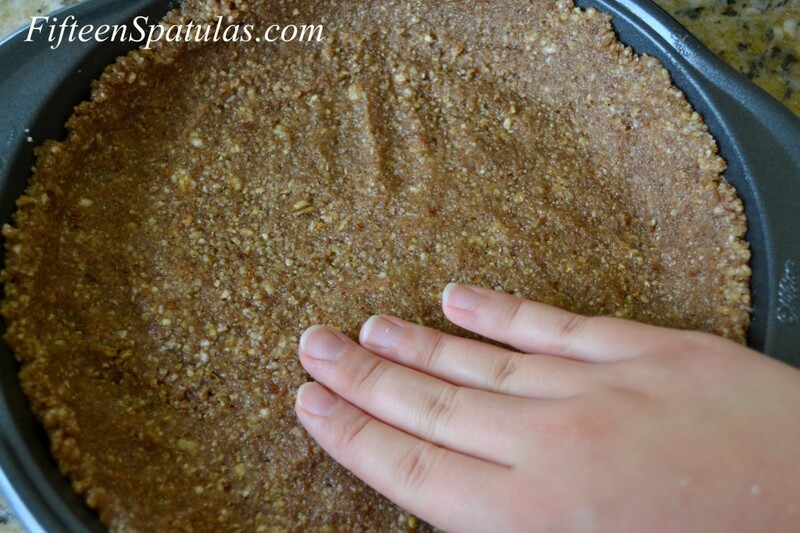 Do you have any other recipes you could make with the pecan crust. I LOVE PECANS! Hi joanne how do u do a graham craker crust ? Hi Ali, I would do it similarly to how I do my gingersnap cookie crust, and the recipe for that is here: https://www.fifteenspatulas.com/2012/02/23/mini-cheesecakes-with-gingersnap-crust-and-raspberry-sauce/ Basically, what you do is pulse graham crackers in the food processor until it’s ground up into a fine crumb, then you mix in a few tbsp of melted butter (3tbsp per cup of ground crumbs), and then you can press it out into your pan. Good luck and let me know if you have any more questions!